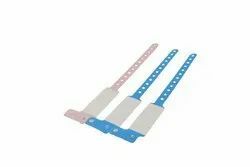 We are the manufacturers of Patient Wristbands, the Wristbands are printed with thermal print process which gives more clarity and legible print along with barcode and text, these are fully resistant to water,alcohol,soaps and chemicals also. These are benefited by reducing expense of printer inks and ribbons,also legal cost associated with patient mis-identification errors. 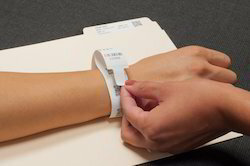 Patient Identification Band are an important way to reduce patient safety risks. This Product avoid chances of medication errors, testing errors and the discharge of infants to the wrong families. Today, with lot of hectic procedure this product makes system secure and smooth running and helps minimize medical errors. We can offer Customized color with Logo for institute as well promotional activity. 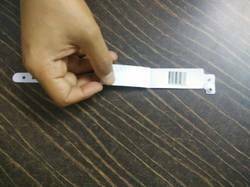 We offer a quality range of Baby ID Band that helps minimize medical errors and administrative issues, the offered bands are checked under the supervision of our quality experts against the exquisite parameters of quality in order to ensure its quality. These bands are highly demanded in the market for their color options. The Barcode Patient ID bandsystems as more and more hospitals are choosing the coding systems to identify patients. Thermal printer bands can be printed within seconds using a thermal printer. Soft thermal band ensures greatest comfort for patients. These are available with high quality bar codes that can be scanned accurately. No laminate overlay on wrist band and labels resist moisture, alcohol and hand sanitizer to preserve patient data. The bar codes support text, linear and 2D bar codes, photos and graphics. engaged in offering an excellent range of Barcode Wristbands. Our offered range is manufactured using top notched grade basic material and progressive techniques in compliance with the set industrial standards. These are widely appreciated amongst our clients for their durability flexibility and are highly demanded in the market. Offered products are checked as per industry set parameters to ensure the entire range is free from any sort of production defects. 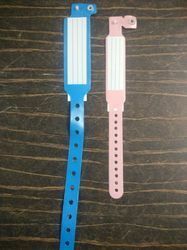 We feel proud to introduce ourselves as the leading manufacturer, trader, wholesaler and supplier of a superior quality Infant Wrist Bands.Infant Wrist Bands have identification numbers to co-relate the mother with the baby along with any other family member. 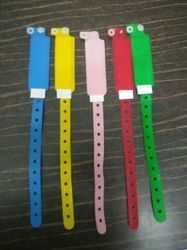 Available in insert card and write on types, these bands can also be availed in a variety of colors Our provided wrist bands are made using soft and comfortable vinyl material, which is extremely safe for the sensitive skin of the baby. Insert Card Band are an important way to reduce patient safety risks. This Product avoid chances of medication errors, testing errors and the discharge of infants to the wrong families. Today, with lot of hectic procedure this product makes system secure and smooth running and helps minimize medical errors. We can offer Customized color with Logo for institute as well promotional activity. With our organization belief to offer qualitative range of products, we are involved in offering a beautiful collection of Mother Wrist Band for our valuable customers. 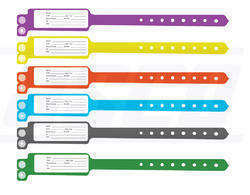 We offers Child ID Band .Our ID bands are best in soft and best in quality. 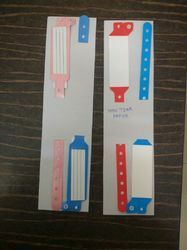 Relying on our competent team of designers, we are betrothed in manufacturing and supplying an eye-catching Hospital ID Band for our esteemed patrons all over the globe. The presented band is stringently examined under the observation of our competent professionals against the exquisite parameters of quality to reassure the fault less assortment to our patrons. This is highly demanded in the market for its design, resilience and perfect finish among our patrons. Looking for Hospital Wrist Band ?